Navigating a makeup brush kit can be intimidating—there are somany to choose from. 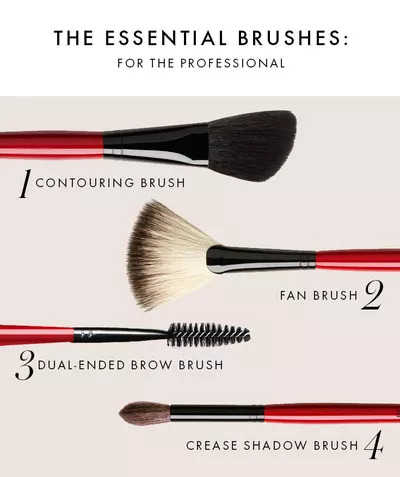 There has been a brush invented for every single type of application imaginable, most of which we'd never even dream of attempting without a makeup artist (and perhaps a medic) on hand. We've broken down the entire process for you so you can go back to living your best beauty junky life without a care in the world. 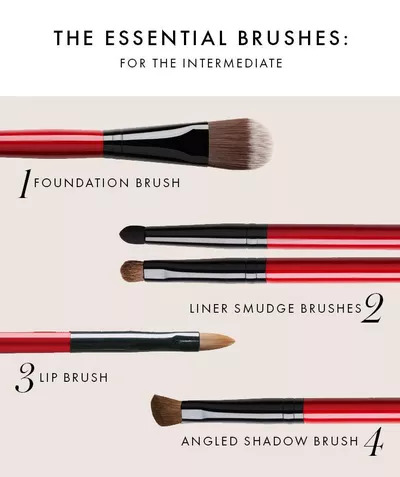 Based on your skill level (beginning, intermediate, full-blown makeup addict) Global PRO Artist for Smashbox Lori Taylor-Davis has mapped out every brush you need and why. Yeah, it's that good. And yes, you're welcome. 1. An eye shadow brush like is great for applying, blending, and packing shadow into the lid. Try: NARS #40 Eye Shadow Brush. 2. A perfectly shaped blush brush is a must-have tool for beginners because it allows the product to fully show on the cheekbone. It gives a seamless application of product onto the apples of the cheeks. Try: Bobbi Brown Blush Brush. 3. A bent eyeliner brush allows beginners to apply all textures of eyeliners on the eyes. It bends to the shape of your eyes and gives control for flawless application in easy strokes. Try: Laura Mercier Angled Eye Liner Brush. 4. 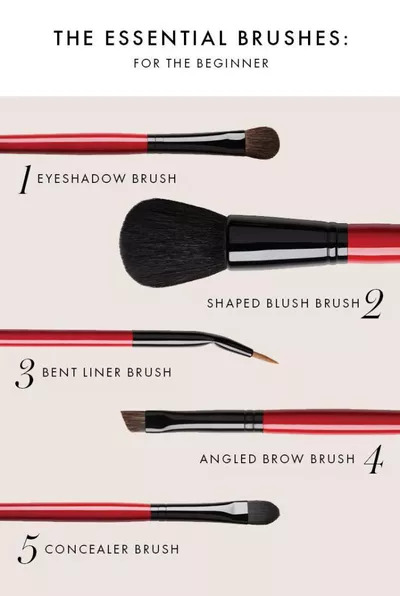 A brow brush is great for beginners because the brows frame the face, and a little tweak goes a long way. It has stiff bristles which help create a perfect brow arch.Try: MAC 208 Angled Brow Brush. 5. A concealer brush with a precision-tip helps to apply cream and liquid concealers in hard-to-reach places. It gives a perfectly blended finish to the face. Try: Smashbox Precision Concealer Brush #5. 1. A foundation brush is great for intermediate beauty junkies. Unlike beginners—who usually use their hands to apply foundation—this girl knows the value a proper application. It allows you to apply different textures of product for a more seamless finish. Try: Le Metier de Beaute Angled Foundation Brush. 2. A smudgy liner brush is a great tool to have on hand to achieve a more masterful smoky eye. Try: Smashbox's Double-Ended Smudger Brush #20. 3. A lip brush is works to achieve a perfect lipstick application, every time because it allows you to outline and shape your lips so they won't smear. Try: Louise Young Cosmetics LY29 Retractable Lip Brush. 4. A double-ended brush is convenient for intermediates to have on hand in order to work dry and cream products and achieve very different effects. Try: Lancôme Dual-End Liner & Shadow Brush #18. 1. A contouring brush is necessary for advanced makeup users because they're privy to the tricks of highlighting and shading. Try:Sephora Collection Pro Angled Contour Brush #75. 2. A fan brush flawlessly applies highlighting products. It allows for the right amount of product to be distributed on certain areas of the face. Try: Eminence Fan Applicator Brush. 3. A double-ended brow brush with a spoolie on one side and an angled brush on the other shapes the brows and allows for the precise application product. Try: Bare Escentuals BareMinerals Brow Master Brush. 4. A crease brush is perfect for picking up and blending shadow into the eye crease, which allows for more depth when you're going for a fancy eye look. Try: Smashbox Crease Brush #10.